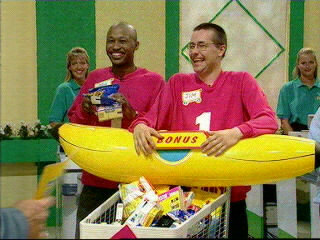 In the final weeksbefore the general election, as the rapid pursuit for promises becomes more fraught, the election campaign metaphorically turns into the final dash in 1990s television programme Supermarket Sweep. In the Big Sweep round contestants would find themselves torn between collecting Dale Winton’s shopping list and an unknown quantity of inflatable fruit and their hidden bonuses. The latter seemed more attractive but the former guaranteed £100 being added to the shopping total. More importantly, it was a surefire way to victory and the Super Sweep prize money. Getting your strategy right mattered. In the same vein, it is important to remember why switchers matter. Those of us who hold to a Philip Gould model of campaigning are not harking back to a never-to-be-returned-to era but instead we know that he held some truths we should not forsake. Switchers from the Conservatives matter, not because ‘triangulation’ has any particular virtue – in fact the idea of triangulation is dead as a political idea, if it ever really existed – but simply because those who move their votes between the two main parties count as ‘double’. When Labour candidates and canvassers convince someone who supported David Cameron’s party at the last election to vote Labour that person’s vote counts on our pile and simultaneously comes off our main opponent’s pile. This means our adversaries have to convince one of our voters back in return (harder to do when the tide is against them) or find two former non-voters or third party voters to join their cause to offset Labour’s gain. More difficult still, they then need to get them to turn out. Considering how weak the Tory machine on the ground is, this is even more of a challenge. It is because the reward is higher that the task is both harder and more exhilarating when achieved. However hard, though, this lesson should not be forgotten. Why is it not the same against the Liberal Democrats? It is, but only in the 13 seats in England and Wales where we are targeting seats held by the junior partner in the coalition. But a baker’s dozens of seats does not a national strategy make. Anyone pursuing a ‘35 per cent strategy’ would have given up on these switchers; organisers on the ground, at least, have not. In his publication for the Fabian Society’s Next Majority series, Marcus Roberts suggests that Labour target seats require just a one per cent swing from the Tories. This preciously small number of voters – on average just 400 per seat – could decide the outcome in Labour’s favour in 72 contests. This puts Labour on course for a double-digit majority. Ed Miliband and his team would rightly count that as a pretty good turnaround from our second worst-ever defeat. It might even mean that the party nationally could withstand double-digit losses in Scotland and still have a Labour majority, or near enough with a Tory speaker and a handful of Sinn Fein members of parliament not turning up. As we get closer and closer to the election, the voter pool that Labour activists speak to will get smaller and smaller. The aim is to go into polling day with enough Labour promises to get you over the winning line and then spend all of polling day reminding them to vote. Without a last-minute focus on the switchers the campaign team will be left like one of Winton’s contestants – unable to take part in the Super Sweep and asked to go home empty-handed.